In these economically dire times where people are struggling to even find a modest home for their family of four, it’s a matter of privilege to be able to afford a house with a garden, even if it is small. Gardens are the perfect place to set up a table and some chairs to enjoy your breakfast, your evening tea, or entertain guests. If you have a small garden at the back or front of your house, you already know how it enhances the aesthetics. However, being the proud owner of a garden is not sufficient; you also need to know how to decorate and design your small garden in a way that utilizes available space, making it look just how you want it to while also offering maximum utility. Here are a few offbeat ideas you can incorporate or get inspired by if you’re on a mission to decorate the small garden in your new house or renovate an existing one. If floor space is limited but your heart yearns for the greenery, you can transform an existing wall or a new one into a living wall by planting creepers. This will add to the lushness without occupying additional space, which works perfectly for small homes already yearning for more space. It also looks amazingly artistic. What’s more, for social media lovers, this patch of green can make a great background for your Instagram pictures! Sometimes, adding the smallest of elements can make the most conspicuous of changes. Instead of going for it all, choose one aspect of the garden that you want to highlight and focus on that. The colour, the light, the floor, the patterns, or the plants/shrubs/cacti – whatever it is that you want to highlight in your garden, depending on the climate, can be your focal point. Don’t overdo every aspect as this will only make your already small garden look even more cluttered. Remember to also include pathways or gravel ways, if you like, along with your favourite armchair to make the small space look big. Three is a magic number even when it comes to gardens. You ought to remember that this applies to the garden floor as well as the colours you see in the garden surroundings. For the flooring, you can go for the simple sandstone, gravel, and sand, which makes for the perfect combination. Every visitor will find it delightful to walk into this lush, gorgeously decorated garden, no matter how small it is. To choose the right colours for your garden, set a colour palette and stick to it instead of going for contrasting combinations or, even worse, adding every colour you like. The rule of three will also apply to the colour palette you choose. The fences, plants, accessories for the garden, and the furniture should all complement each other. Some people tend to display a preference for wooden, old-school settees when it comes to garden and patio furniture, but its practicality in a small garden needs to be given some amount of consideration. Heavily carved wooden chairs and tables are not only hard to maintain (especially if you live in a tropical area where it rains a lot) but it also makes your small garden space look extremely cramped. Experts recommend iron settees to replace the wooden ones in order to make the garden look light and airy. It is even easier to maintain as you can just fold it up and store if it starts to pour. It’s great to have plants that can look fresh, novel, and prove useful the whole year round. But your small garden also needs changes more often than the large ones. Seasonal exotic plants are great when you’re looking for some variety without signing up for more expenses. Let the single specimen season plants take over the smaller pots and add some radiance and colour to your garden. Sure, the garden will look stunning during the sunrises and sunsets, but guests don’t visit you keeping these in mind. You need to make sure that all the effort that you put into the garden gets highlighted, literally. Besides trusting the ever-wonderful natural light, make sure you take care of the artificial ones too, which have the potential to make your garden look amazing. Try layering the lighting. First, light the pathways, the sitting area, and the steps (if any). Second, light up the particular feature that you want everyone to notice – it may be the water feature, a small exotic plant, or even a wall. Next, try adding a subtle layer of lighting close to the floor to add that extra hint of awesomeness that will act as the cherry on top of the cake. It’s possible that you may be struggling to get some privacy since high fences are a big no-no when it comes to small gardens. In order to prevent passer-by’s from peeping in for a view, smartly place a tall shrub or the wall of your garden at a place where it will conceal the view. Place your settees accordingly. Your geometry lessons from school will come in handy here. Think about patterns that will make the space look bigger and cleaner. Look for clean, straight lines – they are easier to implement. If you want some softness as opposed to the sharpness of straight lines, add some light bends and curves, making sure that they don’t overwhelm the sight of an onlooker. 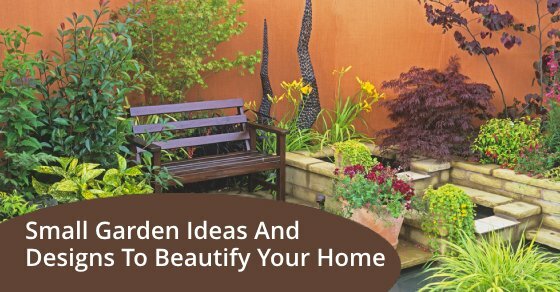 While you’re decorating a small garden, it’s important to not let trends determine your decisions, but really think about what you want your house as a whole to look like, what purpose you want the garden to serve, and how much you’re willing to spend on the decoration and the maintenance. Take a wide look at it all at every stage of the designing and plan your next steps accordingly. For more information, contact In the Backyard at +1 844-434-4224 or contact us here.